Olivier Nakache and Éric Toledano made waves on the international film scene back in 2011 when their feel-good dramedy The Intouchables made over $400 million worldwide. The film was nothing more than your typical adult-focused piece of counter-programming that comes out every year (think The Best Exotic Marigold Hotel or Victoria and Abdul to get a sense of the tone and audience it’s seeking), but its broad comedy and sentimentality struck a chord the two filmmakers have yet to repeat. C’est la vie, their latest collaboration, is yet another collection of broad strokes, this time taking the form of an ensemble comedy about a wedding party gone wrong. Wedding planner Max (Jean-Pierre Bacri) finds himself going through a tough time; he’s been having an affair with co-worker Josiane (Suzanne Clément) who’s pressuring him to break off his marriage so they can be together, and he’s about to oversee a massive wedding held at a gorgeous chateau. 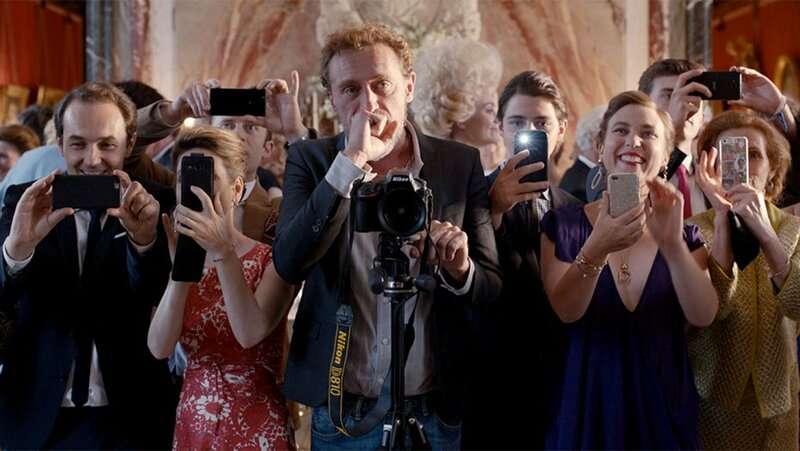 Problems abound from the start, and the film explores various subplots involving party staff and wedding guests, whether it’s the arrogant groom (Benjamin Lavernhe), the cocky band leader (Gilles Lellouche), the obnoxious photographer (Jean-Paul Rouve) or the lovelorn waiter (Vincent Macaigne). None of these storylines ever really come together as much as they chart their own orbits around the ceremony, with a few collisions here and there. Nakache and Toledano’s bread and butter is through generalizing as much as possible, hitting certain emotional or story beats in a way that puts familiarity over everything else. Their film has a universal quality in its construction and in trying to appeal to the largest audience possible they churn out a bland product. One of several running jokes involves an ignorant staffer who tends to blurt out the obvious (“Looks like Max is pissed off,” he says after Max freaks out on everyone for causing another problem with the wedding). Anyone watching this can understand the joke’s purpose as an attempt at levity, but it’s never funny. It’s a transparent effort at using a familiar joke structure to wring out an easy laugh. Nakache and Toledano don’t try to make this funny, they just film the beats we expect and fill in the blanks where needed. It’s a strange sight to witness, since both filmmakers show such a strong hand at directing they clearly know the tropes they’re copying from, yet the opposite seems to be true in their writing. For the most part, it’s the talent both in front of and behind the camera that keeps C’est la vie going, pulling off its pick and mix of clichés with enough skill to make it passable like comfort food. Subplots tend to be hit and miss but some—like a love/hate relationship between Lellouche’s band leader and Max’s bullish second-in-command (Eye Haidara)—get elevated by its talent to the point of forgiving the film’s piss-poor way it handles its female characters (all of them being a combination of overly sappy, nagging, “bitchy,” or manipulative). But Nakache and Toldeano’s coasting takes a hard fall in the film’s climax, which sees a group of Sri Lankan immigrant dishwashers save the wedding by providing the affluent guests with a bit of “cultural flavour.” Much like Intouchables and their previous film Samba, Nakache and Toledano touch of France’s immigration issue with a well-meaning but completely block-headed approach that veers on the offensive. It’s this blend of competence and ignorance that seems to make up Nakache and Toledano’s filmography, and with C’est la vie, they show no signs of making any adjustments to this formula that’s served them so well.